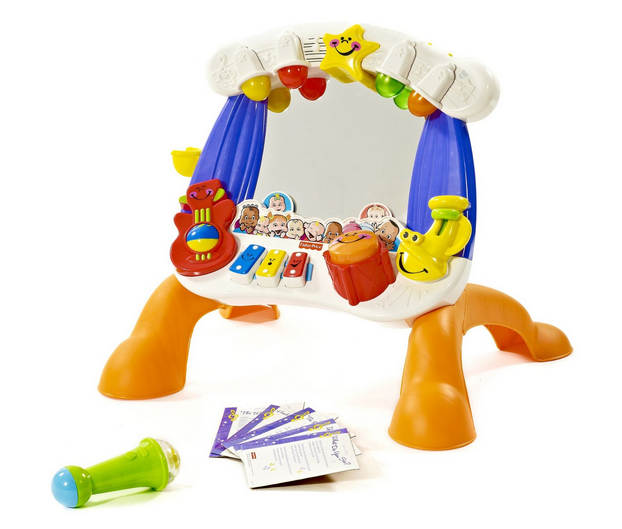 You are here: Home / Resources / 7 Fisher-Price Learning Toys To Help Your Baby Develop! Please note, I use Amazon affiliate links below, which means if you click on a link I may recieve a small comission from your purchase. I’m not sure exactly when it happened, but sometime after our first child was born I became a toy connoisseur. I’ve learned to judge a toy by more than it’s fun-looking cover. I’ve learned to notice how loud the toy’s volume is, how bright it lights up, and even how a certain toy helps my child with Down syndrome develop and learn. Prior to having a little boy born with developmental delays (our son was born with Down syndrome) I thought toys were just, well, toys. Boy was I ever wrong! As it turns out all those bright, loud, colorful (and sometimes annoying) baby toys actually serve a developmental purpose! That’s right toys help teach our kids! I quickly learned he wasn’t just playing with toys, he was learning….developing….getting smarter and stronger! His tiny little brain was growing and developing. And that’s a parenting win! In fact, my wife even wrote an article about how toys and occupational therapy go hand in hand. I’ve watched Noah play with lots of developmental toys, and there are a handful that have really stood out. And not simply because he enjoys playing with them, but because of how how well they help him learn. In fact, almost all of the toys I mention on this list have been used by his physical or occupational therapist as they help him work on his developmental milestones. Friends and family sometimes wonder what the best toys are for a child with Down syndrome when birthday’s and Christmas’s roll around. Some wonder if you need to buy special toys for a child with special needs. The truth of the matter is kids are kids. When trying to pick out what to buy a baby with Down syndrome as present, a person should do the same thing they would do for any other child; check out the age requirements for the toy printed on the front of the toy’s packaging. The developmental goals for children at this age are pretty much the same regardless of if the child was born with Down syndrome or not. If you are trying to find a good developmental toy for your toddler, or baby, this list is a good start. One other thing I like about these toys is they will grow with your child. You’ll find that you can use them in different ways, to work (and play) on different goals for your child. Many of these toys we had before Noah could even sit up on his own, and at 20 months old he still gets daily use out of them! Talk about a toy win! 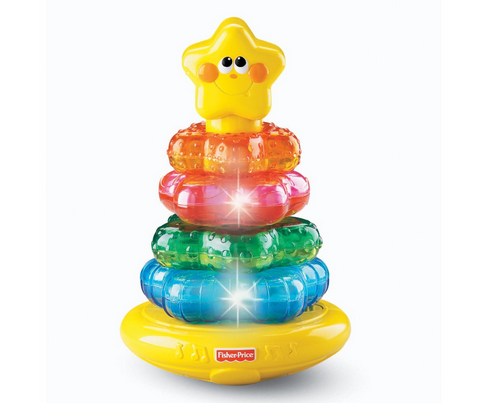 The Fisher-Price Little Superstar Sing-Along Stage is without a doubt our favorite toy on this list! Noah has played with toys more than any other toy he owns. If you look at the link I posted you’ll notice this toy has a ton of great reviews on Amazon, so I’m not alone in saying how great this toy is. (In fact, when I mentioned it on our Facebook page once, I had a ton of comments from other parents saying how much their child liked it as well. I think the reason it’s such a hit is because of how many different things this toy does. It has a mirror, and what child doesn’t like looking at them self in a mirror? It lights up. It plays music. It has a big orange button they can press on the front of it. 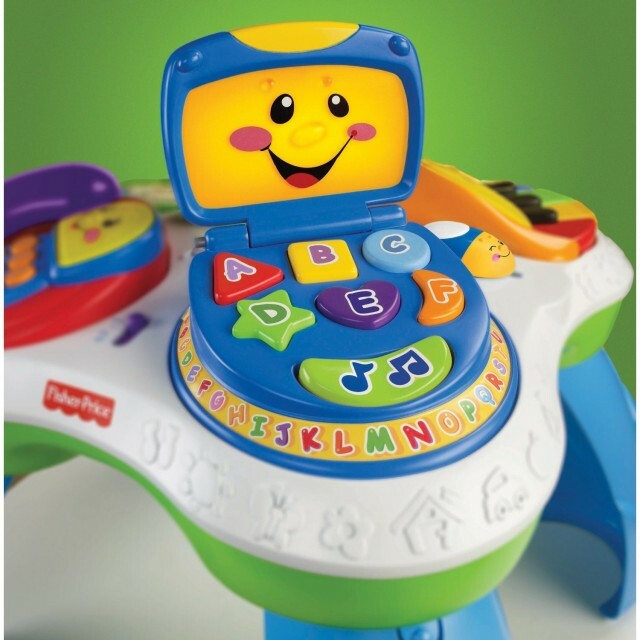 And, here’s a super random thing about this toy….every once in a while the toy will play some fun kid music followed by the phrase, “You’re a star!” Do you know what Noah’s first word was? STAR! Now I have no idea if that’s because he heard that word so much while playing with this toy, but that’s my best guess. Funny, huh? Anyway, I can’t recommend this sing-along stage enough! 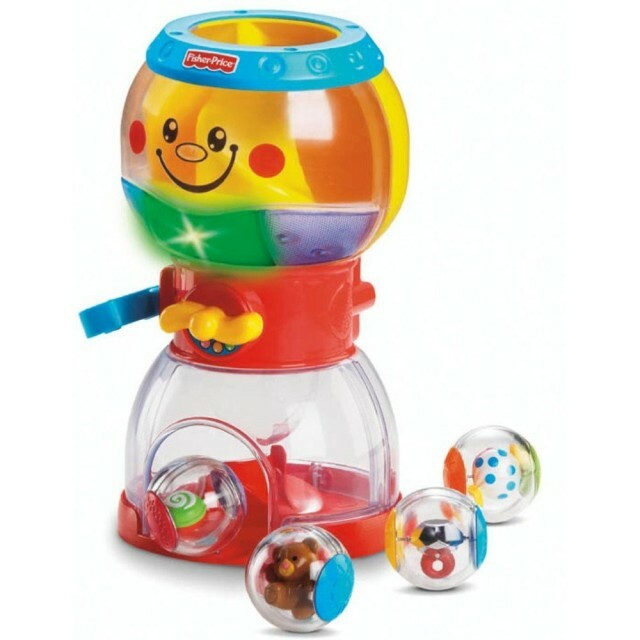 The Fisher Price Roll-a-Rounds Swirlin Surprise Gumball machine is another one of Noah’s favorites. 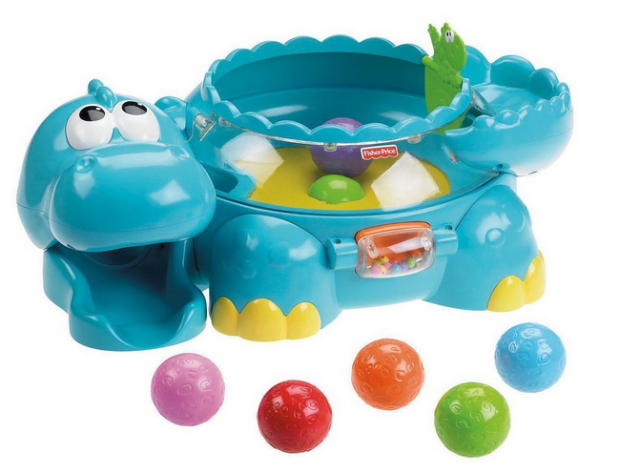 The gumball machine comes with these fun sensory balls that your child can drop in the top. They then press the handle which causes the balls to drop down the little spiral and out the front of the toy. The best part is when the balls drop down, the toy lights up and plays fun music that Noah really enjoys. In the last few months, Noah has gotten really good at pressing the handle and watching the balls come flying out. Check out this video I took last week of him playing with this gumball machine, cute huh? 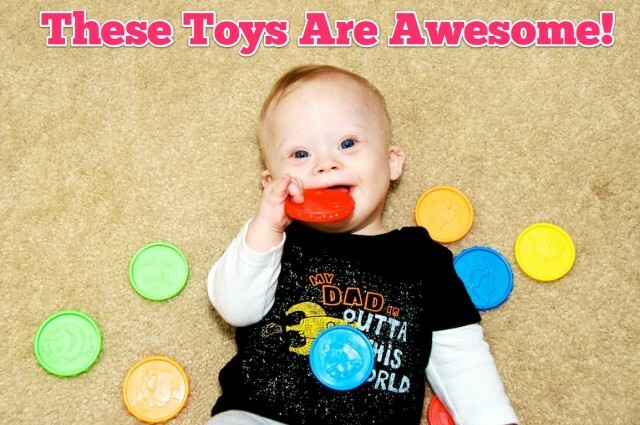 We mentioned many of these toys on our list of the top 10 Christmas gift ideas for a child with Down syndrome, but it’s a post worth checking out. In fact, the comments have toy suggestions from other parents as well. Have you used any of the toys on this list, if so what was your experience with them? 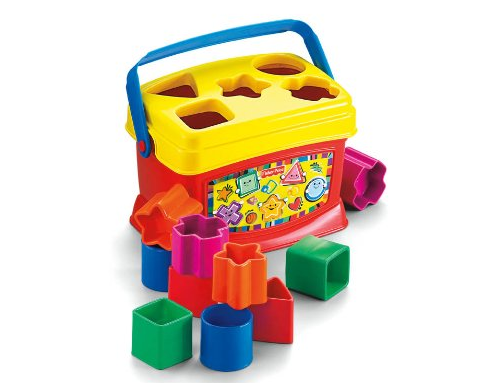 What’s one of your child’s favorite developmental toys that I left off the list? Leave a comment and tell us about it! Posted on the video, but I’ll post here, too. Thanks for all of the great toy ideas! My husband and I are expecting a little girl in September who was diagnosed with Noonan syndrome via amnio (caused my a mutation in the PTPN11 gene in the 12th chromosome). We’re so excited to bring her into our family (especially our 3 year old boy) and it’s great to know that there are toys that will help with her development! Is there any spesific reason you/Noah like the nr 5: Poppety pop musical dino? Maybe I will buy this for my daughter with Down syndrome. She is 6 months old. I love the toy ideas! Thanks for sharing. I love the classic stacker; got to get it! how old is he noah while he is playing in the video?thank u for answer! I’m not sure what video you are talking about as there is no video on this blog pos. However each video has a date that appears at the start of each video. Noah was born in December of 2010. So you’ve just got to do a little math. yes.i have a boy with ds 1 year old next mounth! My daughter has the gum ball machine and the piggy bank. She is almost 15 months and she loves both of these toys. She loves the gum ball machine for the same reasons Noah does! She loves to press the handle and clap when they come rolling out the bottom. 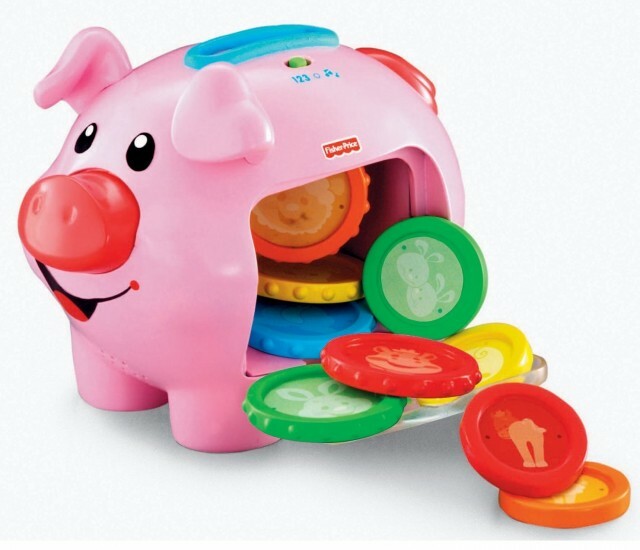 She spends a lot of time putting the coins in the piggy bank and gets a kick out of fitting them in the slot! Do you think my baby needs a occupational therepy coz now they just send her a teacher but no therapist . Let me tell you my baby is just turned 4 months have diagnosed with D’S and Heart problem. She already had her first surgery. Did she get an evaluation? therapists really help, check into it, the services are free when part of early intervention. Looks like they don’t make the stage anymore!! Super bummed!! I will keep looking for it though because I know my little boy would love it! Thank you for posting these toys! Posted earlier from my phone but I don’t think it went though. After reading about the toys you recommended I thought my little boy would love the stage but it looks like they don’t make it anymore!! Super bummed!! Guess I can try ebay! =) Thanks for the toy recommendations!! You share very good information thank you, I am learning a lot from you and the caring of your son. I have a granddaughter with Down syndrome that I help take care of when her parents are working…I have been looking for toys that she would benefit from you just helped my search..thank you! I also found that Aubree likes the Fischer Price worm, it lights up, makes noise and has a small mirror. I look forward to more post! be very grateful if you could elaborate a little bit more. Appreciate it! my baby Keziah is ds. at 5 months her neck is so weak. Does anyone have ideas for a 7 (almost 8) year old boy with Down Syndrome? He absolutely loves his iPad so even app suggestions? When looking for a pretend kitchen set, there are a few things to consider–size and placement topping the list. that is not in clear sight. Thanks trying to pick out a present for my son turning 2 with down syndrome going to go with the superstar singing stage one. He loves music and lights! !